Site designs offer a great way to standardize the look and feel of your site collections. However, you can't do some things with site designs, like add a footer to every page. You can use the PnP provisioning engine to create a template that you can use to provision an Application Customizer to a site. This Application Customizer can then update your page design, for example to register a footer on every page. This article describes how to create a site design that applies a PnP provisioning template to a site. The template will add an Application Customizer to render a footer. You'll use these components to trigger the PnP provisioning code after you create the site and apply the site design. To set up app-only access, you need to have two different pages on your tenant—one on the regular site, and the other on your SharePoint administration site. Go to following URL in your tenant: https://[yourtenant].sharepoint.com/_layouts/15/appregnew.aspx (you can go to any site, but for now pick the root site). Next to the Client Id and Client Secret fields, choose the Generate button. 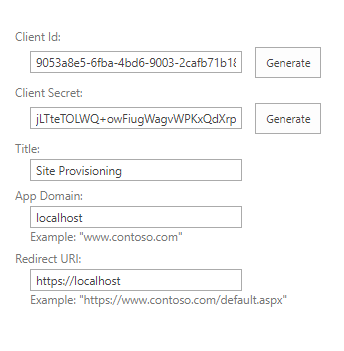 Enter a title for your app, such as Site Provisioning. In the App Domain box, enter localhost. In the Redirect URI box, enter https://localhost. Copy the values for Client Id and Client Secret because you will need them later. Go to https://[yourtenant]-admin.sharepoint.com/_layouts/appinv.aspx (notice the -admin in the URL). In the App Id field, paste the Client ID that you copied, and choose Lookup. To confirm that you want to trust this app, choose Trust It. 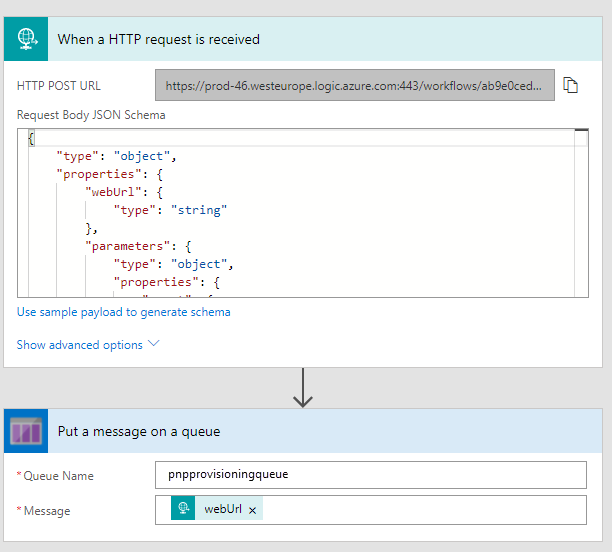 In this section, you will use Azure Queue storage to receive messages from Microsoft Flow. Every time a message shows up in the Queue storage, an Azure function is triggered to run a PowerShell script. Go to the Azure portal and sign in. Choose + Create a resource. From the Azure Marketplace listings, select Storage, and in the Featured column, choose Storage account - blob, file, table, queue. Provide values for the required fields. Select Pin to dashboard, and choose Create. It can take a few minutes for the storage account to be created. Open the storage account and go to Queues. Choose + Queue at the top of the screen. Enter pnpprovisioningqueue for the name, or enter your own value; be sure to follow the naming standard. Make note of the queue name; you will need this value when you create the Azure Function. Go to Access Keys and note the Storage Account Name and the key1 Key value. You will need these values when you create the flow. To put a message in the queue, you need to create a flow. 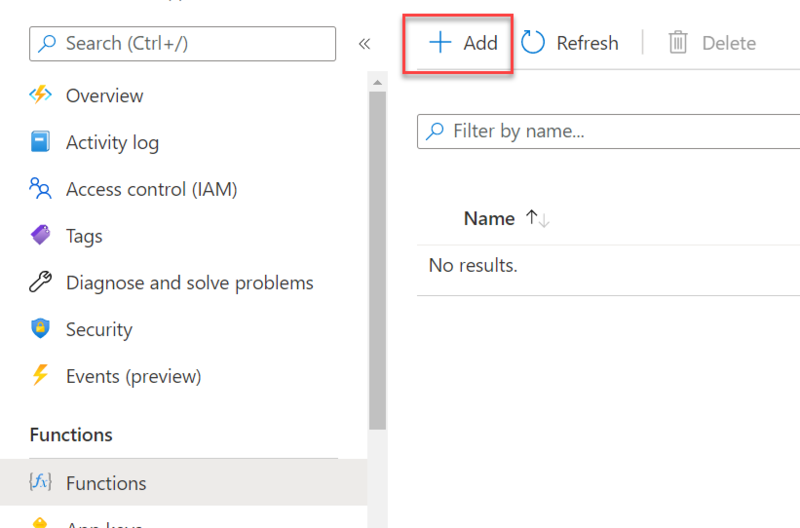 Go to the Microsoft Flow site, sign in, and choose Create from Blank at the top of the page. Choose Search hundreds of connectors and triggers to select your trigger. Search for Request, and select Request - When a HTTP Request is received. Select + New Step and choose Add an action. Search for Azure Queues and select Azure Queues - Put a message on a queue. Enter a descriptive name for the connection. Enter the storage account name that you copied in the previous section. Enter the storage shared key, which is the value of the Key1 key value field of your storage account. Select pnpprovisioningqueue for the queue name. In the request body, you specified an incoming parameter called webUrl. To put the value of that field in the queue, click in the message field and select webUrl from the Dynamic Content picker. Choose Save Flow. This will generate the URL that you will copy in the next step. Choose the first step in your flow ('When an HTTP request is received') and copy the URL. Your flow should look like the following. To test your flow, you have to make a POST request. You can do this via PowerShell, as shown in the following example. When you go to the main screen of your flow, you will see a run history. If your flow worked correctly, it will show Succeeded. Now go to the queue you just created in Azure and choose Refresh. You should see an entry that shows that you correctly invoked the flow. In this section, you'll use an existing SPFx solution, the Regions Footer Application Customizer. Follow the steps in the Readme file in the sample repo to build and provision the solution. Copy the following provisioning template XML to a new file and save the file as FlowDemoTemplate.xml. The provisioning template adds a custom action to a solution. The ClientSideComponentId is associated with the Regions Footer Application Customizer that you provisioned earlier. If you run this demo with your own SPFx solution, change the ClientSideComponentId and optionally the ClientSideComponentProperties attribute values in the XML. Search for Function App and create a new function app. In the Storage field, select Use existing, and select the storage account that you created earlier. Set the other values as required. Currently Function apps a created with the V2 runtime which does not support PowerShell functions. Change the runtime of the function app to V1 by navigating selecting Platform features, Function app settings and change the Runtime version from ~2 to ~1. Create a new function: Functions > New function. Enter the name of the queue you created earlier. Choose Create. An editor where you can enter PowerShell cmdlets will open. Next, you'll upload the PnP PowerShell module so that you can use it in the Azure Function. 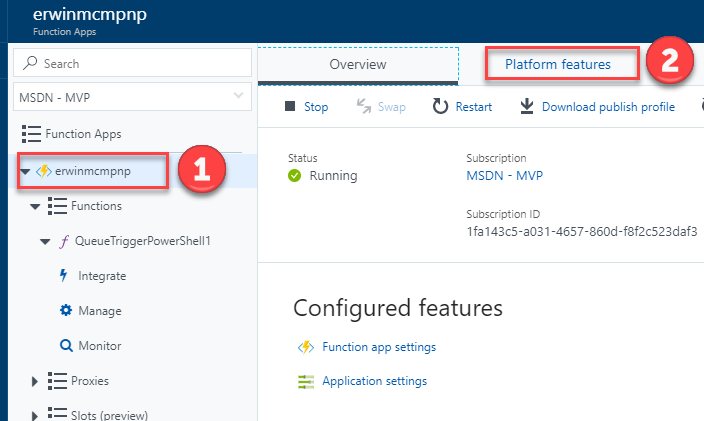 You'll need to download the PnP PowerShell module so that you can upload it for your Azure Function. Create a temporary folder on your computer. The PowerShell module files will download to a folder within the folder that you created. Next, upload the files so that your Azure Function can use the module. Go to the main page of your Function App and select Platform Features. 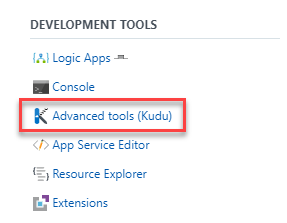 On the main Kudu page, select Debug Console and pick either CMD or PowerShell. Choose the file explorer on the upper part of the page, and go to site\wwwroot\[nameofyourazurefunction]. Create a new folder named modules. In the modules folder, create another folder called SharePointPnPPowerShellOnline and go to that folder. In File Explorer on your computer, go to the folder where you downloaded the PnP PowerShell module files. Open the SharePointPnPPowerShellOnline\2.20.1711.0 folder (notice that the version number might be different). Drag and drop all the files from this folder into the folder in Kudu to upload them. Go back to your Azure Function and expand the files tab to the right. Select Upload and upload the provisioning template file that you created earlier. Write-Output "Incoming request for '$in'"
SPO_AppId - Set the value to the Client ID you copied in the first step when you created your app on your tenant. SPO_AppSecret - Set the value to the Client Secret that you copied in the first step when you created your app on your tenant. Open PowerShell and make sure that you have the SharePoint Online Management Shell installed. Connect to your tenant using Connect-SPOService. Now you can get the existing site designs. To create a site design, you first need to create a site script. A site design is a container that refers to one or more site scripts. Select the JSON again and copy it again to your clipboard. You will see a list of one or more site scripts, including the site script you just created. 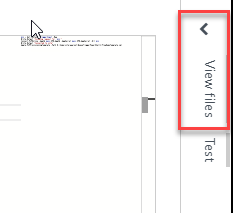 Select the ID of the site script that you created and copy it to the clipboard. Add-SPOSiteDesign -Title "Site with footer" -SiteScripts [Paste the ID of the Site Script here] -WebTemplate "64"
The Add-SPOSiteDesign cmdlet associates the site design with the team site. If you want to associate the design with a communication site, use the value "68". After you created your Azure Queue storage, you created the app ID for app-only access, the Azure Function, and the site design. You then triggered the Microsoft Flow from the site design. To test the results, create a new site. In your SharePoint tenant, select SharePoint > Create Site > Team Site. Your new site design should show up as a design option. Notice that the site design is applied after the site is created. If you configured it correctly, your flow will be triggered. You can check the run history of the flow to verify that it ran correctly. Note that the footer might not show up immediately; if you don't see it, wait a minute and reload your site to check again.